This Seminar will highlight new issues parents face while keeping children safe. Come represent your organization at the Collaboration Forum! This is a great chance to eat and mingle while learning what other organizations have planned for the fall, and how we can all come together to make the best events possible! Come discover amazing opportunities for academic and personal growth! The Office of Military & Veteran Services invites you to stop by, have some refreshments, and welcome our new and returning military and veteran students at a drop-in. Open to all faculty, staff, and students! Think you have what it takes to be the first GRU Idol? Showcase your singing during a night of fun and competition with your peers! Click HERE to sign up for auditions, or just show-up! All pre-registered performers will get priority in auditions. Come join the Georgia Regents University Gospel Choir at our first meeting! Anybody is welcome to join us, rejoice, and sing praise! Contact JoVawne Fletcher with any questions. Go to www.gru.edu/students/crew and sign-up – or just show up at auditions! All pre-registered performers will get priority in auditions. Come join the GRU Gospel Choir at our first meeting! Anybody is welcome to join us to rejoice and sing praise! Contact JoVawne Fletcher at jfletch7@gru.edu with any questions. Want to get involved? Love event planning? All students are welcome to come see how you can get involved with the Jaguar Production Crew! Contact Taylor Rodriguez, VP of Membership at jpcvpmembership@gmail.com. offer you. You must have a valid JagCard to participate. The American Association of Public Health Dentistry (AAPHD) is having a fundraiser to establish an emergency dental fund for residents of The Salvation Army Center of Hope Shelter. Please come for a good time and to learn about this new organization on campus. Donations: $3. The Iota Phi Chapter of Alpha Mu Gamma will be hosting its annual Salsa Night! The Salsa lesson, taught by Sarah Carter and William Crews, will be featured from 7:45-8:15 pm and general Salsa dancing will occur from 8:15-9:00 pm. Refreshments and light snacks will be served and admission is free for all GRU students. Feel free to also bring a friend or two! Check out our Facebook page (Alpha Mu Gamma at GRU) for important event updates. Contact Sarah Carter, President of Alpha Mu Gamma, at scarte14@gru.edu. Want to help plan Homecoming? This year GRU Homecoming will take place February 16 – 21, 2015. See how you can get involved and make an impact on Homecoming this year! Applications Open Now! Deadline to Apply: Sunday, August 31st. Click the link above to apply. Sign Up to Participate in GRU Idol! Think you have what it takes to be the first GRU Idol? Showcase your singing during a night of fun and competition with your peers! Deadline to sign up: Monday, September 1st. Want to Advertise in PAWPRINTS? PAWPRINTS is a weekly e-newsletter sent to all Augusta students of Georgia Regents University. PAWPRINTS provides a way for students and student organizations to advertise meetings, events, fundraisers, and other activities to the GRU student body. Click the link above for more information. Join us on Thursday, August 21, at 1:30 PM for a review of some basic Study Abroad information, our upcoming 2014-15 programs, and time to answer any specific questions you might have! Come to Allgood Hall, Room E-151. The Center for Undergraduate Research and Scholarship (CURS) is now accepting proposals for the Fall 2014 Brown Bag Seminar series. The application deadline is August 22nd. The Brown Bag Seminars gives undergraduate students the opportunity to present original research or creative activity. Apply today! Trying to find your class? Need a refreshing drink of water or lemonade? Want some information about getting involved or the resources available on campus? Stop by one of the Lemonade Brigade tables manned by student leaders, staff, and faculty members. Come out for a break from classes, a little relaxation, or just to see what the Wellness Center has to offer! From basketball to fitness classes, there is something for EVERYONE at the Wellness Center! Group Exercise classes start in the Group Exercise Room at 4:30 p.m. and go until 7:30 p.m.
*All in the Wellness Center Group Exercise Room. For other class information, visit gru.edu/wellness. Join New Jaguars as the Augusta GreenJackets match up against Hickory for Two-for-Tuesday! Two-For-Tuesdays presented by SweetWater Brewing Company: Fans can enjoy two-for-one pricing on soft drinks and draft beers throughout the ballgame! The first 250 students will be admitted at no cost. Make sure to bring your Student ID. You can also invite one guest per student for $5. Come join the CREW to learn about student clubs and organizations, as well as various departments and offices at our biannual ClubFest! Win prizes and eat carnival-themed snacks by playing various games and learning about the different opportunities offered at GRU. There is something for everybody at ClubFest! Come find out what GRU has to offer you. You must have a valid JagCard to participate. Onyx is an exciting event that showcases our minority student organizations. The event is hosted by the National Pan-Hellenic Council and the Black Student Union and gives the history of each organization as well as a demonstration of what makes each organization unique. Come mix and mingle with new and returning students while enjoying some music, entertainment, and food! For all new Health Science Students. The Professionalism Forum is an annual program for all new students in the health sciences. The program introduces them to several universal concepts and dimensions of professionalism in health care and research including: Service, Leadership, Conduct, Patient- and Family-Centered Care, Cultural Competency, Collegiality and Respect, and Personal Accountability. Students must be prepared to handle many of the same difficult situations and dilemmas as working professionals in the health sciences, so this program challenges them to start thinking and acting professionally as they begin the formative part of their careers. It’s that time again, let’s kick off the new academic year! GRU is going to Adventure Crossing on Friday, August 22nd from 8:00 PM to 12:00 AM. This will be a great night filled with games, laser tag, go karts, and many other options. The first 350 students will be admitted for $5.00. Make sure to bring your validated JagCard. You can also invite a guest for $10.00. There will be a shuttle from the University Village. 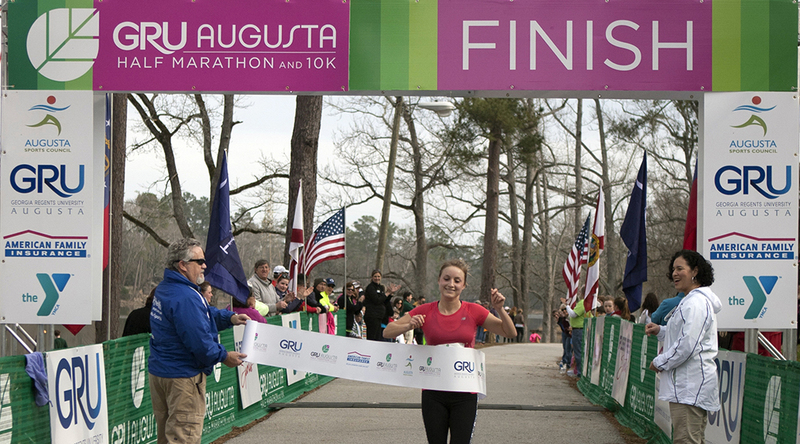 Aubrey Armento, a third-year medical student at the Medical College of Georgia at Georgia Regents University, came in on top for the female division in the GRU Augusta Half Marathon with a time of 1:31:42. The marathon, with its more than 1,500 participants, was held on Feb. 23 in downtown Augusta. The 24-year-old Atlanta native said that she changed her regular routine while training for the race. And while she is a longtime runner, she was very excited, as this is her first win. And not only did she win, but she won by seven minutes, which is quite a lead. Overall, U.S. Coast Guard member Matthew Eyler finished first in the race with a time of 1:15:15. Another notable GRU finisher was Susan Norton, Vice President for Human Resources, who came in third in her age division.